Kant, Latour and Others: The Pass, part 1. Kant, Latour, and others: The Pass. Sometimes, one is lead back into a certain truth that does not again circle back into various truths. For example; this computer that I am typing this essay on functions to allow me to make this post. But we will not yet, right this second, get into the Kantian syntheticals and analytics because those are an example of the meaning of this essay. So; the fact that this computer functions to allow me to write this essay and post it so that you are reading it right now, is true. 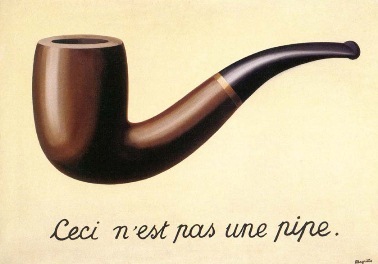 As an analogy to my point here, It is a singular truth, yet some philosophers and theorists would want to knock this down through, what we could call, “The Method of Treachery”, which, basically, is modern-post-modernism wrapped up in a painting called “The Treachery of Images”, by Rene Magritte. Such game players would often come back to say that the statement ‘this computer functions to allow me to write this essay and post it so that you are reading it right now’ functions as truth, but is not, in itself, true. My question then would be, how is it that they may make that statement and have any meaning whatsoever? How can we say that everything is just propositions, just statements? If something is functioning, then how can what it functions to do be anything but true? In this we must now address the instigation of Emmanuel Kant. In his “The Critique of Pure Reason”, he states what prompted his investigation: He was attempting to account for what we generally know as superstition, or superstitious beliefs. The motivating assumption was the common human being involved with the common ability and capacity for communication, education and intelligence; in short: enlightenment. He was attempting to account for how it is that something which seems so foreign and silly to him yet still functions for people; as well and by extension, how is it that ignorance does not know itself as ignorance. If you are not able to see the connection I made; I am saying that indeed there is a computer here and I am typing on it, and you are probably reading this on one also. Some of the people that we have come to see as great thinkers and philosophers would say, no; the so called ‘computer’ there is just that, “so called”, and the computer itself we have no clue about what it may be in itself, so the statement I made about it being a truth is not so true, and could be false. So then my rebuttal is how they are able to come to such a conclusion? Specifically, if the true situation I point out is only true within a certain condition of proposal (I am staying away from using the term ‘discourse’ here for now), then how does the rebuttal have any veracity? I could say the same to your statement; for, are you not using it in a function of truth? If it is only probably or possibly true, then what we are talking about is utterly nonsense, and we should just shut up right now. So it goes for the next 80 years or so until we fall into the pit of nothingness out of which a new humanity is hoped to outcrop from itself to become something new or different. We have the compendium of arguments and assertions of nihilism and then ‘new realism’. And then I ask: If it is all based on nothing, why hasn’t the world imploded? Why isn’t the world just gone? Here is Kant’s problem extended out of the hegemonic and colonialist righteousness: How is it that we could be wrong? “self-imposed tutelage” involves the question of this kind of redundancy; namely: If every statement of truth is at most only partly true, then why are we hanging on to that one part of the truth of the statement (to sum) “Its all propositions” that is true and setting aside the probable 99.98% of the proposal that is not so true? It seems to me that there is a whole generation or two of ‘profound thinkers’ that will sit there and argue over the inclusivity and limitation of statements (that they are conditional and contingent upon unrecognized given meanings that are encoded into the means of the proposal), bring up the ‘proofs’ of Delueze and Guattari, and Derrida and such, and yet never even consider how that very situation they argue has very little of the veracity that they suppose for it in its use. If I may: Through all sorts of manner of avoiding their own condition of Being, they will reference other author’s ideas, as if the sense they have of these authors thus accounts for their Being is a world because is ‘makes the most sense’. Again: the Issue of Kant. It seems to me that such a line of discussion, while metaphysically and therefore religiously very interesting, is practically nonsense, despite if we can use it for anything but creating problems and justifying one’s faith. (Im not getting into the discussion about faith and discourse here; see my second book of the series, The Philosophical Hack , called “The Moment of Decisive Significance”. ) Keep in mind also that I am making a distinction here and that it is always possible that any author can miss the significance of her or his own work; as I suggest in my first book of The Philosophical Hack, Kant’s thesis of propositions allow for us a distinction that carries through to perpetuating a cloudy philosophical arena, and at that, apparently on purpose; the conspiracy is maintained by repeated reference to what is common and lowest: That which reduces must always consider one more that is lower, to then include it, raise it up to the reductions horizontal plane, to justify one’s raised position by asserting that what is lower or less is not but equal (Note: This is the opposite of the Ontological Argument). In this way, the insecurity that always accompanies denial (again, see the books of The Philosophical Hack) is justified by imposing a potential of intelligence upon the lower who otherwise would not know of its lesser state, but that he exists in a potential defined by his superior. This is all to say that Kant’s claim was based in a particular moment, and that once the moment plays, he must then not be saying anything about propositions, but that propositions evidence a particular division in the accounting for human existence. Kant is not saying very much about how propositions establish worlds, nor how to find a world through dissecting propositions. The academics that would learn and teach Kant’s method (Again: see the first book of The Philosophical Hack) as a kind of means to find out something about the addressor or some world is perpetuating a particular kind of world in the process. I have argued that this kind of world is real, but also that Kant was talking about a different kind of world. So, at this point we find at times that one does not always realize the true meaning of what one says; others tell one the meaning of what one said. We find, further, that we cannot always rely upon an ability for finding out just what people meant by what they said; that no matter how they try to explain to us what they meant, we simply do not understand. The idea that we can reference an author herself and in all instances, as her original intension can be discovered, find out what she really was saying, is, as I say, a real occurrence, an occasion of real faith. My question is, if what someone said is true, then why are we still discussing it? There is a whole ‘world’ of great thinkers that have no idea what this question might entail, even while arguing with me about the meaning of it. The meaning is plain: If discussion is the only thing that establishes the ontological foundations of reality, then why are we still arguing over what this is? I call this the real principle of redundancy. These notions describe an aspect of philosophy that, further, we could put under, say, a principle of veracity. This principle would point out only two possibilities in the nature of communication: What is true; and what is misunderstood. Yet in as much as there is an indication of a divergence, a point or moment where or when the idea behind, say, (as our example) Kant’s notions of the proposition actually define such polemical situation (of what is true and what is misunderstood), we are capable of understanding that what is misunderstood constitutes the aggregate of cause for further discussion, and due to this predominance, this overwhelming normative aspect soon comes to be understood as the omnipresent situation, such that we begin to understand the default ‘given’ which informs all (conventional) philosophical method, so that it must and could only argue itself to that state of nothingness which underlies all things, and to further thereby be able to argue (as speculative theory is a real operational mode at all times despite what definitions are in place) the truth of reality founded entirely in discourse. It is a self-fulfilling prophecy. Previous Some Kierkegaard writtings for free.